When I asked the Divas in my community who have endometriosis, one of the top frustrations of having endo (next to the pain and fertility struggles) is the bloating, sometimes called the “endo belly”. No one likes to be bloated and asked if they’re pregnant because of their belly sticking out. I don’t have endo and even I’ve had that experience- embarrassing and not at all fun. It can be especially difficult to deal with if you don’t understand why it’s happening, and if your doctors have zero solutions for you (beyond more birth control or surgeries). “Endo belly” and digestive issues with endo are so common, one study showed that 96% of women with endo (vs 64% without) experienced high levels of bloating and gut-related symptoms. To add insult to injury, more research has shown that women receiving hormonal treatment (like the birth control pill) had higher bloating severity ratings and discomfort scores than women with endo who didn’t use hormonal treatments. WOW. Why Do I Get a Bloated “Endo Belly”? There’s a number of reasons why women experience “endo belly” and I’ll outline the top 3 I see all the time. Endometriosis is a condition that includes estrogen dominance. Simply put, this is having too much estrogen in relation to progesterone. This happens in women with endo for many reasons, including the fact they endo creates more hormonally active tissue in the body. Additionally, constipation or other gut problems coupled with endo mean that estrogen isn’t being excreted from the body as it should, potentially building up and creating more issues. High levels of estrogen contribute to “endo belly” because it causes water retention. At its core, endometriosis is a disease of inflammation. The mechanisms of which I will have to dedicate an entire blog post to at some point soon! Inflammation is often throughout the whole body, with the majority taking up residence in the pelvis- right where the unwanted endo tissue is. Besides the fact that this inflammation can cause changes in bowel and digestive health (more on that below) the inflammation of the endo tissue itself can contribute to bloating. Much of this is because of inflammation in the gut, allowing potentially harmful particles and pathogens through the lining of the gut into the bloodstream where they create immune overreaction, inflammation and hormonal imbalances. Sometimes this is known as “leaky gut”. Additionally, the adhesion of endo tissue to digestive organs (small intestine, large intestine and bladder) can create issues. As the tissues evolves, grows and moves around, instantaneous gut symptoms can arise. I’m sure you know what I mean if you’ve ever been feeling good and then all of a sudden that “endo belly” pops up for seemingly no reason at all! There’s also bacteria at work here. We have more individual bacteria in and on our bodies than we do human cells. Think about that for a second- read it again and really take in the significance. More than human cells. In women with endometriosis, there’s often an extreme imbalance between “good” bacteria (aka probiotics) and “bad” bacteria. We all have both, and that’s totally normal- but we need to have more good than bad to stay healthy. More bad bacteria = more bloating, gas, and pain. For example, in one study of 50 women with endometriosis, a full 40 of them tested positive for SIBO (small intestinal bacterial overgrowth) upon a breath test. Now to the good news! 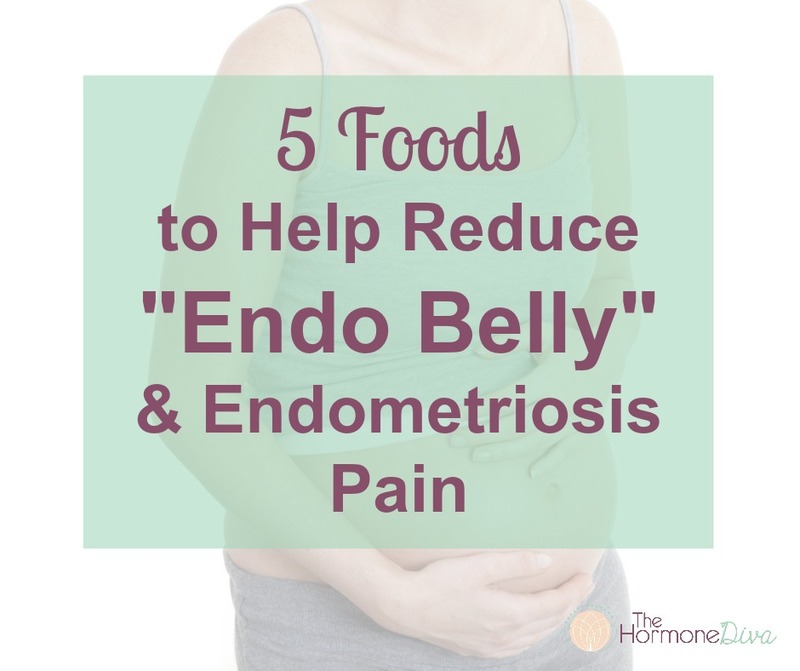 There are foods you can use to help prevent “endo belly” and reduce it once it’s already shown up. Obviously, being a holistic practitioner, I recommend doing everything you can to prevent the “endo belly”, but maybe you’re reading this now because you’re super bloated, in which case- the foods I’m suggesting will help as well. One of my absolute favourite “superfoods” for any hormonal condition is sauerkraut. And I don’t mean the crappy stuff sitting in a jar on the shelf of your grocery store- no. I mean, the live, fermented, find-it-in-the-fridge-section, no vinegar or sugar kind of sauerkraut. In case you’re not familiar, sauerkraut is basically fermented cabbage. If you buy it fresh, from the fridge, you’re getting loads of enzymes and live probiotics to feed your gut. The yucky stuff on the dry shelf in the store is NOT what you want. Ingredients should be cabbage, salt, maybe some bacterial starter and other flavours (IE ginger, caraway seed). No vinegar or sugar should be included for a truly fermented sauerkraut. Cabbage is part of the cruciferous vegetable family, and this family of vegetables has an affinity for detoxing excess estrogen through compounds like I3C and DIM. Happy Hormones Tip: Include 2 tbsp to ¼ cup raw sauerkraut with one meal per day to enjoy the benefits. Robyn- why would I want to drink MORE water when I’m already retaining so much? Well, drinking water helps to flush the kidneys and reduce water retention and bloating. Drinking half your bodyweight in ounces of water daily is a good place to start. Yes, you’ll pee more. And, you won’t be so bloated, so it’s totally worth it IMO. For example, a 140 pound woman needs approximately 70 ounces of water in a day (140lbs ➗ 2 = 70). Obviously, clean, filtered water is best. Did you know that even tap water contains trace of hormones that women pee out when they use the birth control pill? The last thing women with endo need is more estrogen. I have a water filter pitcher at home that I LOVE and removes SO MANY contaminants, even heavy metals (which can inflame the body and contribute to hormonal imbalances). This is the one I use (and this is the filter water bottle I use). Also- the water tastes like the most amazing, fresh and invigorating water you’ve ever had (besides taking it right from a spring). It’s 100% worth it. Happy Hormones Tip: Get yourself a water filter, and pre-fill water bottles with filtered water each morning to the amount of H2O you need in a day. Simply drink through your pre-measured bottles to ensure you get enough! So inexpensive, yet a true “superfood”. One of my favourite starchy carbs for women in general, and a really great addition to an endometriosis diet, especially when there’s bloating and digestive troubles. While women women may have issues digesting other starches and carbs (like grains- rice, quinoa, oats, barley, etc and potatoes) sweet potatoes are generally much easier to digest, and are extremely soothing to a troubled digestive tract. Sweet potatoes contain a lot of beta-carotene, a potent antioxidant and precursor to vitamin A. In fact, just 1 cup of baked sweet potato contains approximately 1921mcg of beta-carotene, making it an excellent source. Once converted into active vitamin A (aka retinol), beta-carotene is helpful in repairing the lining of the gut. Sweet potatoes also contain fibre, and getting adequate fibre is key to excreting excess estrogen through the bowels so it doesn’t build up and contribute to endo issues. Sweet potatoes are also quite high in B vitamins, and this vitamin family is needed for hormone production, energy, plus fat, carb and protein digestion. For example, sweet potatoes contain vitamin B6, which is known to help increase progesterone (therefore helping with estrogen dominance) and boosts mood. P.S. The antioxidants and compounds in sweet potatoes make them extremely anti-inflammatory. Happy Hormones Tip: Bake a bunch of sweet potatoes on the weekend to reheat and enjoy through the week. You can even put cooked sweet potato flesh in smoothies for an extra boost! Another gut and inflammation helper is apple cider vinegar. Like sauerkraut, you must source the right kind of apple cider vinegar. It should be raw and unpasteurized, and the bottle should say “with the mother”. Basically that means some of the original bacteria used to create that vinegar is included in the bottle. That’s where the medicinal stuff is at. It’s still inexpensive, but might be a buck or two more than pasteurized apple cider vinegar. Also like true sauerkraut, raw apple cider vinegar is a fermented food. That means it’s packed full of “good” bacteria or probiotics, essential for bringing balance back to a stressed out endo digestive system. Raw apple cider vinegar also contains enzymes and acids to help digestion. Specifically, using raw apple cider vinegar helps to increase levels of stomach acid, or hydrochloric acid. We desperately need adequate stomach acid to break down and absorb proteins and to kill “bad” bacteria and pathogens before they get deeper in the gut. Happy Hormones Tip: Take 1 tsp – 1 tbsp raw apple cider vinegar in water upon waking to start enjoying some of its benefits. Another inexpensive “superfood”, bone broth is a critical addition to the diet of women with endometriosis, in my opinion. Bone broth contains many healing elements, including minerals like magnesium, silicon, sulphur and more. Bone broth also contains collagen, a protein essential for healthy hair, skin and nails. Collagen (and the minerals in bone broth) all work to heal and soothe gut lining. Bone broth is incredibly easy to digest, making it wonderful for those who get bloating and other symptoms easily with almost any food- especially during an endo flare up. Ideally, bone broth can be consumed a few times per week to enjoy the benefits. There are even bone broth powders out there not to make it even easier. Happy Hormones Tip: Every time you make meat with bones (like a whole chicken) save the bones. Toss them in a ziploc bag in the freezer. Once you have a bag full of bones, make bone broth. Freeze the broth and you always have some on hand. A slow cooker makes easy work of this. An easy way to get all these amazing foods? Make a soup out of sweet potato, water and bone broth, before you eat it enjoy a small cup of warm water with apple cider vinegar, and have some sauerkraut on the side. Done!